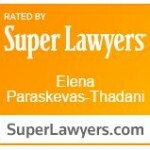 EPT Legal Attorney Elena Paraskevas-Thadani Named in 2016 Super Lawyers: Super Lawyers, a Thomson Reuters business, is a rating service of outstanding lawyers from more than 70 practice areas who have attained a high-degree of peer recognition and professional achievement. The patented selection process includes independent research, peer nominations and peer evaluations. The lawyers selected are those the publisher deems among the state’s top 5 based on peer recognition and professional accomplishments, including verdicts and settlements, representative clients, experience and honors and awards, among other criteria.